SCHEDEL - [Text page with historical personalities, Kings and Queens. Derwerlt. Blat. LXXXIX ]. SCHEDEL, H. - [Text page with historical personalities, Kings and Queens. Derwerlt. Blat. LXXXIX ]. [Text page with historical personalities, Kings and Queens. Derwerlt. Blat. LXXXIX ]. - SCHEDEL, H.
Title : [Text page with historical personalities, Kings and Queens. Derwerlt. Blat. LXXXIX ].. 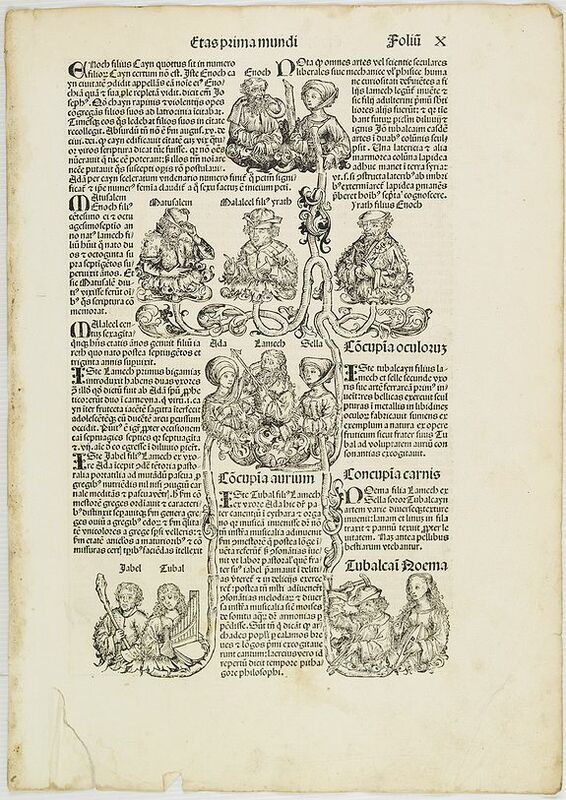 Description :Latin text page with woodcuts on recto and verso of important personalities of antiquity and patriarchs of the Genesis, descendants of the Gospel and Jesus. To name a few : Enoch the son of Jared, a great-grandfather of Noah, and father of Methuselah (Genesis 5:1-18). Also Ada, the mother of Jabal and Jubal. Page from the richest illustrated Incunable, the famous: Nuremberg Chronicle , published the year that Columbus returned to Europe after discovering America. In May of 1493 appeared in the Latin language one of the earliest voluminous books, fully illustrated with 1809 woodcuts printed from 645 woodblocks. The woodblock cutters were Michael Wolgemut, the well-known teacher o f Albrecht Dürer, and his stepson Wilhelm Pleydenwurff. Wohlgemut was Albrecht Dürer's tutor between 1486-90 and recent scholarship has shown, Albrecht Dürer may also have collaborated, since some of the cuts bear a remarkably close resemblance to the Apocalypse illustrations. Condition : Some marginal browning and staining. Repaired marginal tear in the lower left corner. Dark impression on large sheet.